BlackBerry Wireless Headset HS-500 Available Now | BlackBerry Blast! 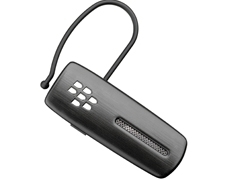 RIM's first official BlackBerry Wireless Headset is now available from the BlackBerry Accessories Store. You can pick yours up for $79.99 now. "Get the freedom of hands-free calling with the easy-to-use BlackBerry® Wireless Headset HS-500. With the simple touch of a button, you can answer, end, and mute calls, or activate voice dialing, even while you're juggling your keys and coffee in the morning. Plus, the volume automatically adjusts and background noise is reduced, so your calls and turn-by-turn directions can be heard loud and clear in noisy environments. With the quality and performance you expect from a BlackBerry® product, the BlackBerry Wireless Headset HS-500 fits your life so you can hit the road with confidence."